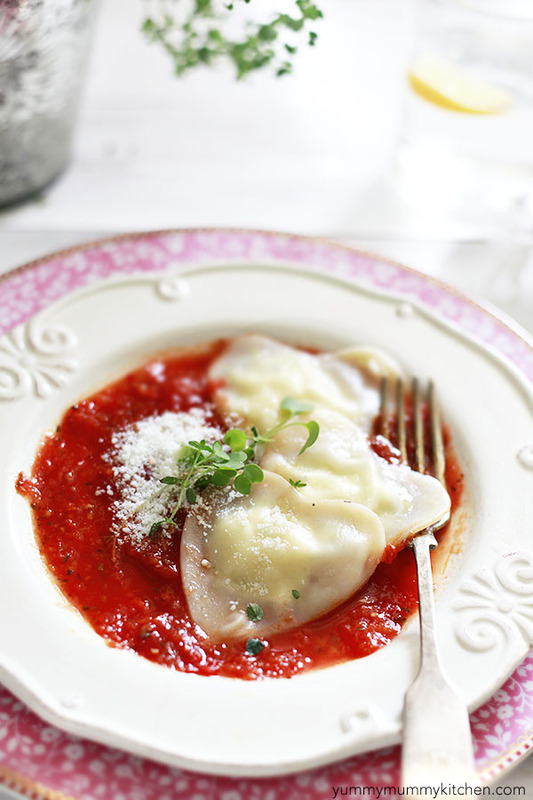 Homemade cheese ravioli recipe made simple with wonton wrappers. Adorably hart shaped for Valentine’s day. Last year some of my girlfriends and I got together for a Valentine’s Day themed supper club. I brought beet and goat cheese puff pastry app bites, but my favorite dish was heart shaped shrimp pot stickers made by my friend Jenn – she was kind enough to post the recipe here. Ever since that night I’ve been meaning to make her pot sticker recipe or try making heart shaped ravioli. Only simplified by using wonton wrappers. Well, I finally did it – only took me a year! I was able to get this all done early and then refrigerate the uncooked ravioli until dinnertime. I absolutely love making homemade pasta with the flour and the well for the egg and the kneading, and so on. But, there’s just not always time for that on busy weeknights! These wonton wrappers worked amazingly well and tasted just like homemade pasta. I was expecting some of the ravioli to fall apart, cheesy insides seeping out into the boiling water. I pressed the egg-washed boarders together to prevent this, and took it a step further by pressing some with a fork. As it turned out, pressing with a fork was not at all necessary, as all my cutie pie hearts remained intact! I’m now a huge fan of you, wonton wrappers! Where have you been all my life? 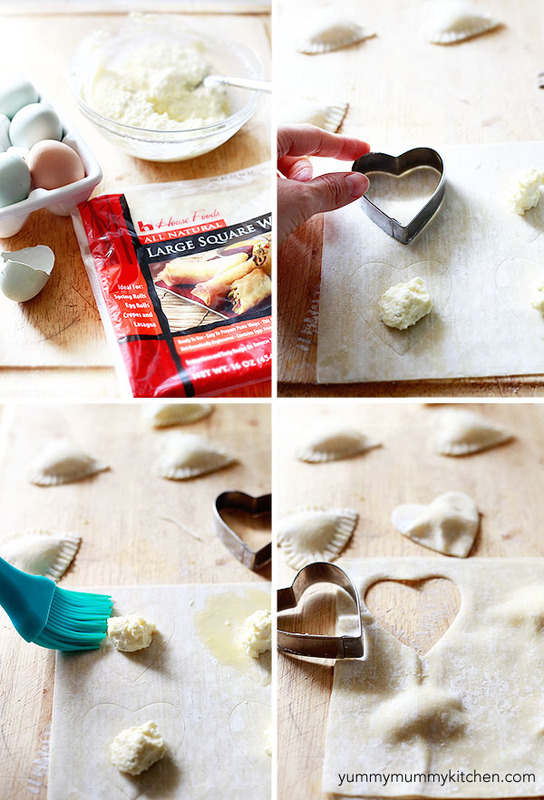 Make these tasty fresh ravioli for Valentine’s Day or any day! If you want to make these even simpler, forget the cookie cutter and simply fold wonton wrapper squares in half over the filling for triangles. Yield: about 30 pieces using a 2 1/2 inch cutter. In a medium bowl, mix together the ricotta, goat cheese, Parmesan, 1 of the eggs, and parsley until combined. Lay one wonton wrapper on work surface. Lightly press cookie cutter into the wrapper just so that you can see the shape when the cutter is removed, not so that it cuts all the way through. This will help you to know how much filling to add. Spoon a dollop of filling onto the center of the heart shape on the wonton wrapper. Make sure to leave plenty of border all the way around for the top layer to adhere to. Lightly beat the second egg in a small bowl with one tablespoon water to make an egg wash. Brush the egg wash onto the bottom layer of the wonton sheet around the filling. Gently place the top sheet over the filling and press around the filling mound to stick the top and bottom laters together. Use the cookie cutter to cut all the way through the ravioli. Firmly press the edges together and set aside. Continue until all the wonton wrappers have been used. Refrigerate ravioli or cook right away. To cook fresh ravioli, bring a large pot of salted water to a boil. Gently drop ravioli into the water and boil until cooked through (they should be puffed up and floating at the top), 3-5 minutes. Serve with your favorite sauce, grated Parmesan, fresh herbs, and/or microgreens.